Spatholobus suberectus (most common species traded today and the official species in the Pharmacopoeia of the People's Republic of China); see Figure 1; additionally Spatholobus harmandii and Spatholobus sinensis are used as substitutes. Millettia dielsiana, Millettia nitida, Millettia speciosa, Millettia gentliana, Millettia reticulata, Millettia pachycarpa. Mucuna birdwoodiana, Mucuna sempervirens, Mucuna castanea. This group of plants represents a relatively recent addition to the Chinese Materia Medica, first recorded two centuries ago in the Bencao Gangmu Shiyi (Omissions from the Grand Materia Medica, 1765 A.D.), where it was said that it "activates blood, warms the waist and knees, and cures paralysis caused by wind." This herb is not included in any of the commonly mentioned traditional herb formulas from the Qing Dynasty (1644-1911 A.D.). Under the heading Mucuna it is stated that "Mucuna is scarcely worth mentioning medicinally." The limited information for this genus is that it "is a tonic." 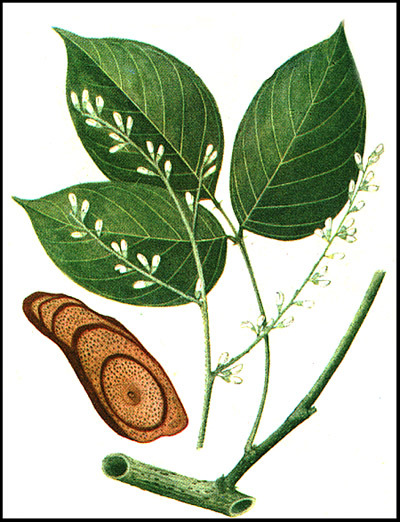 Under the heading Millettia, it is stated that it "has few uses from the Malay Peninsula and Indonesia;" some mention of the leaves and root are made, but not of the stem; as to Chinese use, it is mentioned that Millettia dielsiana is "employed locally in Yunnan as anti-anemic; a new compound was isolated from the reddish bark; Millettia pachycarpa is used as a tonic and to induce the growth of red blood cells." For Spatholobus, Chinese uses are not mentioned, though applications in Burma and Indonesia include: "ingestion of the sap as a treatment for faulty menstruation and uterine hemorrhage; an infusion of the stem is taken also to treat cough and fever." Jixueteng was deemed inconsequential enough that it was not included in the Synopsis of the Pharmacopoeia (2) prepared at the American College of Traditional Chinese Medicine in 1984, though the authors mentioned the herb in some sample prescriptions for recovering the hemopoietic system in their 1980 booklet Treatment of Toxic Side Effects Resulting From Radiation and Chemotherapy by Traditional Chinese Medicine (17). The herb is also absent from many of the illustrated Materia Medica guides that were compiled during the 1980's. In the book Aging and Blood Stasis (32), written by a physician who worked from the 1930's to the 1980's, jixueteng, commonly classified as an herb for promoting blood circulation and treating blood stasis, is not included in any of the prescriptions. The situation has changed dramatically in recent years: millettia has been elevated to one of the commonly used herbs of modern Chinese medicine. The traditional actions of jixueteng mentioned in modern works, such as Chinese-English Manual of Common-Used Herbs of Traditional Chinese Medicine (3), are: "To enrich the blood and promote blood circulation, relax tendons and activate meridians." Traditional indications are: "For blood deficiency and blood stasis syndrome manifesting as anemia, menalgia (painful menstruation), menoxenia (menstrual bleeding), or soreness, numbness, and immovability of extremities." As another example, in Modern Study and Application of Materia Medica (43), its actions are: "To tonify the blood and activate its circulation, relieve rigidity of muscles and joints, and promote menstruation." The indications are "Arthralgia due to wind and dampness, aching pain in the waist and knees, numbness of the extremities, malnutrition of the muscles and tendons, and irregular menstruation and amenorrhea due to deficiency of the blood." Depending on the source book consulted, jixueteng is found classified either as a blood nourishing herb, along with tang-kuei, peony, rehmannia, and ho-shou-wu, or as a blood vitalizing herb, along with salvia and red peony. In recent attempts to classify the blood vitalizing herbs into subgroups, Li Lianda (21) placed millettia along with tang-kuei, moutan, salvia, raw rehmannia, and red peony as "mildly active herbs, nourishing the blood to promote circulation." The essence of fluid and grain is injected into the meridians and forms yingqi. It then circulates to the heart and transforms into blood. The blood flows to every part of the body and moistens and lubricates all tissues. When there is insufficiency of yingqi, the vaporization [dispersement] of qi is endangered. Thus, the blood does not flow smoothly, encouraging the formation of blood stasis and ecchymosis [congealed blood, outside the vessels]. New blood is unable to be generated when obstructed by stasis and ecchymosis. Consequently, therapeutic measures are taken to remove the obstruction and regenerate blood. For this function, Cheung mentions the herbs tang-kuei, salvia, millettia, and turtle shell. Under millettia, he describes the functions as "tonifies and circulates blood, loosens ligaments, vitalizes the luo vessels, eliminates blood stasis and ecchymosis, and generates new blood and tissue." The indications given are "blood deficiency diseases involving the meridians, draft wetness, numbness, cold pain." In harmonizing the blood, jixueteng is best at quickening the network vessels and freeing the channels. Cooked into paste, it is referred to as Jixueteng Jiao and is particularly strong. Yu Nanzhi [a famous herbalist] refers to this as a great supplementer of qi and blood, being most appropriate in geriatric and gynecological illnesses. References to "activate meridians," "vitalize the luo vessels," and "free the channels" are translations of the Chinese term tongmai. Mai is the general term that means a vessel, channel, meridian, or a passageway, and the term is used in the modern medical sense of blood vessel. Tong means to be able to pass through or, as an activity, to make passable. Thus, tongmai indicates that use of the herb makes it possible for the qi and blood to flow through the meridians without obstruction. Where there is obstruction, one can experience pain, numbness, swelling, and stiffness. In general, the method of activating meridians is based on warming up the yangqi to promote vigorous movement. This formula follows the principle of vitalizing blood to generate new blood and nourishing blood to aid circulation of blood; it is indicated for "advanced stage of bone [marrow] injuries with qi and blood deficiency, or for the tumors with white blood cell or platelet reduction during chemotherapy or radiation therapy (4)." In modern practice, astragalus is often included in formulations of this type to treat the qi deficiency and aid in the generation of blood, even though millettia has been said to have the ability to generate qi. A number of basic preparations of millettia have been described in recent literature. Millettia paste was mentioned in the Annals of Shunning Fu (40), where it was stated that: "When combined with carthamus, tang-kuei, and oryza, and cooked into paste, jixueteng is a sacred herb for blood diseases." Millettia Wine and Millettia, Shouwu, and Longan Wine are mentioned as treatments of wind diseases and blood deficiency syndrome: millettia, as a single herb, for bi syndrome (arthralgia and myalgia), and the three-ingredient wine for "lassitude of extremities, dizziness, palpitation, insomnia, early greying of hair, and pallor due to deficiency of both qi and blood (41)." Millettia Sugar Broth, in which jixueteng is decocted and combined with 40% its weight of sugar, and used for treating loss of blood and anemia, is mentioned in Chinese Medicinal Herbs (40). Millettia usage in food therapy has also been described (44, 45). Millettia is boiled with eggs (after the egg is hard boiled, the shell is removed, and the egg returned to the decoction for continued cooking); sometimes jujube is included. Then, the eggs are eaten and the decoction drunk as a treatment for anemia. A tablet made of jixueteng extract as the sole ingredient, Jixueteng Qingao Pian, is produced by the Shanghai Native Medicine Works; it is described as a treatment for bi syndrome; amenorrhea or dysmenorrhea due to deficiency of blood and/or stagnation of blood; and increasing white blood cell count in cancer patients who suffer leukopenia due to chemotherapy or radiation (42). jixueteng injection has also been prepared in China (37). In Dictionary of Chinese Medicine (40, 43), the simple decoction of 30 grams millettia given daily on a long term basis was reported helpful for leukopenia induced by radiation therapy. During the 1980's and up to the present, several clinical trials were conducted involving treatment of leukopenia and thrombocytopenia in which millettia was included in the herbal formulas and results of the therapy were reported in Chinese medical journals. The Astragalus-Jujube Combination (Qi Zao Granule) was applied to treating white blood cell suppression from various causes (5). The formula is comprised of 18 grams each of astragalus, jujube, millettia, and hoelen, concentrated into extract granules. According to the clinical report, patients with white blood cell counts below 3.5 were treated for 20-30 days with this mixture: 56% of the patients had their white cell counts increased by at least 4.0 above the initial value and 24% had the white cell counts increased at least 1.0 above the initial value; granulocytes similarly increased. The figures for the response of the control group were 25% and 5% respectively. The same formula was used in the treament of cor pulmonale (22), with lymphocyte transformation rate depressed by the treatment, indicating that the primary effect in leukopenic patients was to benefit white blood cell production. An expanded version of that formula was clinically tested for cancer patients with impaired immune functions (6). The prescription, Shengxue Tang (Generate Blood Decoction), is made with 30 grams each of astragalus and millettia, and 10-15 grams each of hoelen, lycium fruit, pseudostellaria, ligustrum, and cuscuta (the latter four herbs replacing jujube in the Astragalus-Jujube Combination). According to the clinical report, 242 cancer patients, mostly having stomach or intestinal cancer, and being diagnosed as having spleen-qi deficiency, were administered this formula. After only a few days of treatment (each course of therapy was only 2-3 days), macrophage phagocytosis, lymphocyte transformation rates, E-rosette formation rates, and killing ability of natural killer cells of peripheral blood were significantly increased. Hu-chang and millettia (both used to boost white blood cells) were deemed the main herbs in the formula. The herb therapy was initiated 3-5 days prior to starting chemotherapy and continued until one week after finishing chemotherapy. The effectiveness of the therapy was evaluated by considering a broad set of indicators, such as red and white blood cell levels, extent of gastro-intestinal reactions, avoiding loss of hair, and improving tumor shrinkage. According to the author, 39% of the patients had an excellent outcome, and 43% had a notably effective response, while only 7% failed to respond at all. This prescription is an elaboration of one described for leukopenia due to radiotherapy (40), which is comprised of 30 grams each of hu-chang, millettia, and tang-kuei (all used for building blood), along with 9 grams of licorice. In a review (12) of herbal treatments for granulocytopenia (a type of leukopenia), 28 recipes that were reported to be highly effective were analyzed. It was found that the most commonly used herb ingredients were astragalus (in 21 formulas) and jixueteng (in 20 formulas), followed by salvia (in 13 formulas), psoralea (in 12 formulas) and tang-kuei (in 11 formulas). Other herbs that were used repeatedly but in fewer than 10 formulas each were ligustrum, jujube, lycium fruit, epimedium, licorice, and hu-chang. A tablet made primarily with the commonly used herbs, including psoralea, epimedium, ligustrum, astragalus, jujube, tang-kuei, salvia, millettia, and hu-chang, and also containing placenta, cornus, and sanqi (13), was given to cancer patients who suffered leukopenia due to cancer chemotherapy as well as others suffering from leukopenia due to other causes (e.g., chronic hepatitis, drug poisoning, radiation, and unknown causes). According to the report, after a course of treatment of two weeks (15 tablets per day, each tablet 1.85 grams of herb material), leukopenia was completely reversed in 49% of patients and another 29% showed marked improvement in leukocyte counts. In a mouse study of herbal effects on cyclophosphamide-induced leukopenia, a mixture of astragalus, hu-chang, and millettia (Huanghuji Mixture) was compared to the effect of hu-chang alone and with the effect of vitamin B4. According to the report (14), hu-chang had the greatest effect, with the Huanghuji mixture slightly less effective, and vitamin B4 having a relatively weak effect. According to a review of cancer therapy approaches used in China (27), the herbal combination Dao Jing Tong #17, with main ingredients millettia, salvia, and curcuma, was reported to enhance the action of the anti-cancer drug camptothecin against leukemia and it protects against pulmonary fibrosis caused by radiation therapy (these effects were reported in mice studies). It was also reported that "Various preparations for raising the white cell count have been made with the following ingredients: Illicium verum (dahuixiang), sophora, and millettia. They have been used in hundreds of cases of radiation and chemotherapy induced agranulocytosis." These three herbs are in the legume family (see: Legumes). Millettia has been incorporated into several modern prescriptions for treating thrombocytopenia. For example, in a series of reports (10, 33), Fu Xian Tang, also called Sanyao Fang: a decoction made with 30 grams each of millettia and agrimony, and 9 grams of rumex (suanmogen), was given for treatment of thrombocytopenia (33). It was reported that 57 of 62 cases had their platelet count raised to over 100,000. This response occurred within one week for most patients. As another example, a decoction of 15-30 grams each of astragalus, millettia, and codonopsis, 10-30 grams each of tang-kuei and cnidium, 8-10 grams carthamus, and 10-30 grams each of red peony and leonurus, was given one dose per day to patients for an average of one month each (range: one week to two months). In all of the 18 cases of idiopathic thrombocytic purpura (ITP), the platelet count increased to greater than 100,000, but the effects were short-lasting in all but 5 cases (15). A study of three treatments for ITP was conducted using either prednisone, coenzyme A, or a Chinese herb decoction (29) made with 20 grams each of astragalus and polygonatum plus 12 grams atractylodes to tonify qi, 15 grams each of millettia and tang-kuei to nourish and vitalize blood; 12 grams each of red peony and moutan to vitalize blood and cool blood heat; and 10 grams of carthamus to vitalize blood and resolve stasis. Treatments were administered for 4-8 weeks. According to the study report, prednisone had the strongest effect (82% rate of improvement), Chinese herbs had a good effect (65% rate of improvement), and coenzyme A had only a slight effect (35% improvement, but none markedly effective). Patients with acute leukemia often suffer from thrombocytopenia, since the cancerous stem cells that produce leukocytes crowd out the cells that produce platelets. In a study of combined Chinese medical and Western medical treament of acute leukemia (49), 30 patients received standard chemotherapy alone (as a control) or in combination with a decoction made from two types of jixueteng (30 grams each of Spatholobus and Mucuna) and 15 grams of another member of the legume family that has similar actions, moghania (yitiaogen), plus a complex formula containing cynanchum, frankincense, phragmites, hoelen, cissus, pueraria, rehmannia, polygonatum, ligustrum, and oldenlandia (each herb in dosages of 10-30 grams). According to the report, in addition to improving the level of platelets and red blood cells, the herbs contributed to a higher rate of remission than in the control group (83% vs. 63%) and a longer average duration of remission (390 days vs. 268 days). The dosage recommendations for millettia vary among the Materia Medica descriptions. The frequently cited dosage ranges are 9-15 grams per day or 15-30 grams per day, but some sources mention up to 60 grams per day. In one book describing individual species (45), for Millettia nitida, a therapy using 60-120 grams per day was mentioned for anemia. Among the clinical reports reviewed here for which dosage was mentioned, 30 grams per day seems to be the standard amount used, though some formulas included only 15-18 grams. Millettia is frequently incorporated into prescriptions of 8 or more ingredients, but in four of the clinical reports mentioned above, it was used in small formulas with only 2-3 other herbs. Most commonly, millettia was combined with astragalus, lycium fruit, ligustrum, rehmannia, and tang-kuei in formulas for generating blood cells. No reports of toxicity or adverse reaction to millettia have appeared in the Chinese literature available to ITM. In one report (37) on the safety of jixueteng injection (with Spatholobus suberectus specified as the source material), it was stated that its tolerance dose in mice was 200 times the therapeutic dose and that the LD50 in mice was over 100 g/kg, a huge amount. No irritation was induced by injecting the drug into different sites in rabbits. It did not cause allergic reaction in guinea pigs. If injected into mice at high dosage for several days after initiation of pregnancy, it reduced the pregnancy rate; this effect was not observed in rats, however. High doses of millettia (15-30 grams/day or more), such as used in correcting leukopenia, should not be used during pregnancy; in general, Chinese literature recommends avoiding blood-vitalizing herbs during pregnancy, with certain limited exceptions. Flavonoids, which are the dominant group of active constituents for this plant family-found in most of the species in significant quantities-such as those from soybeans (e.g., genistein and diadzein) that have become well-known (see: Flavonoids for health; Soybeans for health). Psoralea, which is used with some frequency in the formulas for treating leukopenia, is a legume that is rich in flavonoids. Polysaccharides, such as those contained in astragalus, that are reported to counteract the bone marrow suppression induced by chemotherapy and to enhance macrophage functions (see: The physiological responses to immunologically-active polysaccharides). Flavonoid compounds similar to those in Spatholobus have been found in other herbs that are reputed to have blood-vitalizing activity, such as dragon's blood (Daemonorops draco: xuejie), sappan (Caesalpinia sappan; sumu) and dalbergia (Dalbergia odifera: jiangxiang); the latter two herbs are in the same plant family as millettia. Like the jixueteng vines, these other herbs have red resins; in fact, sappan was long known in Europe as brasil wood, which means "red dye" wood (the country of Brazil, where this plant was found growing, is named after it). The millettia flavonoids have platelet aggregation inhibiting effects and coronary dilating activity that helps explain their use in treating cardiovascular diseases (19). While many flavonoids are colorless, there are some that are pigments, such as afromosin in Spatholobus and brasilin in sappan. It is possible that the traditional Chinese focus on red colored herbs-originally selected because of the ancient concept that these were affiliated with blood circulation-has resulted in use of a group of herbs with highly effective blood-vitalizing flavonoids, some of which are red pigments. A study of market materials used for jixueteng reveals that the following are also used (30, 31): Kadsura interior, Kadsura heteroclita, and Schizandra propinqua of the Schizandra Family (formerly included in the Magnolia family) and Sargentodoxa cuneata (of the Lardizabalaceae). Kadsura species are widely used in Chinese medicine; for example, kadsura bark (zijingpi) is said to invigorate blood circulation, disperse swelling, remove toxin, clean blood, regulate menstruation, and promote urination; kadsura rhizome (haifengteng) is said to remove wind and dampness and promote the flow of meridians; and kadsura root (hongmuxiang; meaning fragrant red wood) is reported to move qi, invigorate blood, and control pain. These are properties attributed to jixueteng as well. Schizandra, a close relative, is usually used as a source of medicinal fruits, but it is the stem that is used for jixueteng. Sargentodoxa cuneata is known as hongteng (red stem) or as xueteng (blood stem) and is said to remove toxins and furuncles, invigorate blood circulation, promote the flow of channels, dispel wind, and kill intestinal parasites. Like the legumes that give rise to jixueteng, these plants have a red color and are reputed to promote circulation of blood. The active constituents have not been analyzed. Before treatment, there were nucleated cells in 84% (89/106) among the cases with low hemopoietic tissue in the bone marrow, which had been replaced by fatty tissue. Re-examination of 45 cases after treatment showed hyperactive proliferation of bone marrow in 40 cases (89%), the lipid cells decreased, the percentage of granulocytic, erythroblastic, and megakaryotic series increased significantly, and the islands of erythroblastic series could easily be seen. The marrow vascular network was significantly reduced before treatment, even to the extent that no small vessel or capillary was found in sections from 22/106 cases (21%), and expanded and broken sinuses were found. After treatment, the number of vessels significantly increased and the morphology of the sinuses and capillaries became normal with intact wall structure. The reticulofibrosis (RF) of marrow increased after treatment and most of them were fine in appearance, distributed scantily in tissues. No cases showed RF of high degree [diffuse fibroreticulation accompanied with either scattered coarse fibers or local collagen fibrosis]....Study of the bone marrow matrix showed that the increase of vascular network, restoration of vascular structure, and proliferation of RF may be due to the more active new vessels and increased secretion of RF from adventitial reticulocytes to construct the matrix skeleton. Although aplastic anemia differs from bone marrow suppression via chemotherapy or radiation, it is possible that improved microcirculation in the marrow vascular network could also explain some of the effects of millettia on the cancer therapy induced bone marrow suppression. In the cancer cases, the physical damage to the bone marrow is less than in aplastic anemia (at least, initially), but the impairment of stem cell activity might be accompanied by reduced microcirculation. Along these lines, it is of interest to note that another herb, hu-chang, frequently used with millettia in the formulas, has been classified as a blood vitalizing herb in several Chinese texts (sometimes, it is classified among the heat and toxin clearing herbs). In the Bencao Gangmu Shiyi where millettia was first recorded, it is commented that (40): "the decoction of hu-chang is effective for diseases of the bone joints and blood stasis." It is possible that these two herbs are useful in the complex prescriptions for bone marrow disorders because of their contribution to bone marrow microcirculation. When accompanied by other herbs, such as those that contain polysaccharides that may stimulate the bone marrow cells (e.g., astragalus, lycium, epimedium), the bone marrow may be able to function optimally within the limits imposed by the potent activity of the anticancer drugs or repeated radiation exposure. A blood vitalizing combination comprised of 15 grams each millettia and salvia. A kidney tonifying combination comprised of 30 grams each rehmannia and ho-shou-wu, plus 15 grams each of ligustrum, psoralea, and cistanche. A combined therapy group with all seven of the above herbs. Buxue Qufeng Tang: 30 grams each of astragalus, millettia, and polygonum stem; 15 grams each of raw rehmannia, and dictamnus; 12 grams each of codonopsis, tang-kuei, trichosanthes, and isatis leaf; 9 grams clematis; and 5 grams each of angelica, siler, and citrus. Huoxue Qufeng Tang: salvia, cnidium, millettia, tang-kuei, moutan, tribulus, schizonepeta, saussurea, magnetite (proportions not given). Guizhi Tang Jiajian: cinnamon, peony, ginger, jujube, licorice, millettia, smilax, coix, tang-kuei, atractylodes, cyathula (proportions not given); it was reported that 41 of 48 patients suffering from skin ulcers due to persisting wound infections, burns, or varicose veins were cured. Sanbi Wan: tu-huo, chin-chiu, clematis, stephania, chaenomeles, trachelospermum, eucommia, astragalus, cyathula, millettia, loranthus, tang-kuei, siler, cinnamon, and baked licorice. This is recommended for early stage arthritis, involving influence of wind, cold, and dampness (the three inducers of bi, sanbi). Fangfeng Tang: siler, ma-huang, tang-kuei, chin-chiu, pueraria, chiang-huo, schizonepeta, millettia, trachelospermum. This is indicated for "wandering bi," in which the painful sensation migrates, rather than being always in a fixed location. Tao Hong Siwu Tang: astragalus, tang-kuei, codonopsis, cnidium, salvia, rehmannia, persica, carthamus, millettia, earthworm. This is used for skin bi, such as scleroderma, in persons with qi deficiency and blood stagnation syndrome. Shiquan Dabu Tang: ginseng, astragalus, rehmannia, tang-kuei, cinnamon, salvia, hoelen, millettia, baked licorice. This is used for blood vessel bi, such as arteritis, in persons with qi and blood deficiency syndrome. Shentong Zhuyu Tang: persica, carthamus, frankincense, myrrh, tang-kuei, cnidium, millettia, cyathula, liquidambar, chiang-huo. This is used for tendon bi, such as contracting pain in the limbs, in persons with blood stagnation syndrome. Wang Qiuzhou Tang: morus twig, kadsura, millettia, siegesbeckia, cinnamon, cnidium, peony, red peony, myrrh, frankincense; this is used for tennis elbow. In addition, a patent remedy developed during the 1980's, Yao Tong Ling (Anti-Lumbago Tablets, different than the one commonly marketed in the U.S.) is mentioned. It is comprised of tu-huo, chiang-huo, chin-chiu, kadsura, millettia, carthamus, tang-kuei, cnidium, asarum, cinnamon, eucommia, and rehmannia. Millettia has been included in other recent patent products, such as Duzhong Hugu Wan for chronic bi syndrome due to liver and kidney deficiency, and Mugua Wan for limb numbness and weakness (42, 48). For deficiency of qi and weakness of the kidney: astragalus, morinda, cibotium, ophiopogon, cuscuta, pueraria, chaenomeles, achyranthes, tortoise shell, and millettia. For deficiency of kidney and liver, with phlegm-obstruction of the channels: tang-kuei, curcuma, rehmannia, hoelen, acorus, silkworm, ho-shou-wu, salvia, chaenomeles, peony, cnidium, millettia, and zizyphus. Perry LM, Medicinal Plants of East and Southeast Asia, 1980 MIT Press, Cambridge, MA. Cheung CS and Kaw UA, Synopsis of the Pharmacopoeia, 1984 American College of Traditional Chinese Medicine, San Francisco, CA. Ou Ming, ed., Chinese-English Manual of Common-Used Herbs in Traditional Chinese Medicine, 1989 Joint Publishing Co., Hong Kong. Huang Bingshan and Wang Yuxia, Thousand Formulas and Thousand Herbs of Traditional Chinese Medicine, 1993 Heilongjiang Education Press, Harbin. Gao Chiyan, et al., 50 cases of agranulocytosis treated with soluble powder of astragalus and jujube, Journal of Traditional Chinese Medicine 1985; 26(3): 33-34. Rao Xieqing, et al., Observation on immunofunction of spleen-deficiency tumor patients treated with Sheng Xue Tang, Chinese Journal of Traditional and Western Medicine 1991; 11(4): 218-219. Sun Huali and Yu Guiqing, The synergistic effect of Fuzheng Zengxiao Fang on the radiotherapy of malignant tumor, Journal of Traditional Chinese Medicine, 1990; 31(6): 25-29. Wang Yuran, Influence of Shiquan Dabu Tang (Ginseng and Tang-kuei Ten Combination) on immune functions after radio- and chemotherapies in tumor patients, Hubei Journal of Traditional Chinese Medicine 1997; 19(5): 21-22. Zhang Haifan, Observation on curative effect of Huteng Tang (Huzhang and Millettia Combination) in treating side effects caused by cancer chemotherapy, The Practical Journal of Integrated Chinese and Western Medicine 1996; 9(3): 137. Liu Xiaoxiang, et al., Treatment of 30 cases of thrombocytopenia with Fu Xian Tang, Zhejiang Journal of Traditional Chinese Medicine 1989; 24(8): 349. Wang Jie, et al., A study on Fuzheng Guben Fang against adverse reactions induced by chemotherapy, Journal of the Beijing College of Traditional Chinese Medicine 1993; 16(1): 39. Gan Xinjin, Treatment of granulocytopenia with Traditional Chinese Medicine, Zhongyiyao Yanjiu 1994; 3: 63-64. Wang Jinyuan, et al., Clinical and experimental studies on the treatment of leukopenia with Shengbai Tablet, Journal of Traditional Chinese Medicine 1988; 29(1): 32-34. Pang Minxiang and He Xiaohui, Studies on the luekopoietic actions of Polygonum cuspidatum and Huanghuji Mixture, Xinjiang Journal of Traditional Chinese Medicine 1989; 2: 33-35. Deng Youan, et al., Clinical observation on the treatment of thrombopenic purpura with huoxue huayu drugs, Journal of Traditional Chinese Medicine 1988; 8(3): 173-176. Rao Xieqing, et al., Clinical and experimental studies on the treatment of advanced gastric adenoma with Shenxue Tang plus chemotherapy, Chinese Journal of Integrated Traditional and Western Medicine 1987; 7(12): 715-717. Cheung CS, Kaw UA, and Harrison H (compilers), Treatment of Toxic Side Effects Resulting From Radiation and Chemotherapy by Traditional Chinese Medicine, 1980 Traditional Chinese Medical Publisher, San Francisco, CA. Hsu HY, Chen YP, and Hong M, The Chemical Constituents of Oriental Herbs, vol. 2, 1985 Oriental Healing Arts Institute, Long Beach, CA. Chen YP, Chen CC, and Hsu HY, Pharmacological activities of the flavonoids of Bauhinia championii and Millettia reticulata, in Cody V, Middleton E, and Harborne JB (editors), Plant Flavonoids in Biology and Medicine, 1988 Alan R. Liss Inc., New York. Su Eryun and Chen Huishu, Clinical and pathological observation of 106 aplastic anemia patients treated by Spatholobus suberectus Composita, Chinese Journal of Integrated Traditional and Western Medicine 1998; 4(4): 251-254. Li Lianda, Liu Ganzhong, and Sun Hong, Drugs for activating blood circulation to remove blood stasis, in Zhou Jinhuang and Liu Ganzhong (editors), Recent Advances in Chinese Herbal Drugs, 1991 Science Press, Beijing. He Qichang, et al., Treatment of 43 cses of cor pulmonale with Qi Zao Granule, Shanghai Journal of Traditional Chinese Medicine 1989; 10: 32-33. Chace C and Zhang Tingliang (translators, editors), A Qin Bowei Anthology, 1996 Paradigm Publications, Brookline, MA. Cheung CS and Hirano M (compilers), Blood stasis-Ecchymosis entity, Journal of the American College of Traditional Chinese Medicine 1982; 2: 22-32. Lin Jiehou, Bi-entity (arthritis): Clinical experience of master physician Wang Weilan, Journal of the American College of Traditional Chinese Medicine 1983; 3: 3-28. San Weixeng and Ren Qifang, Chronic idiopathic thrombocytopenic purpura: 46 cases with differentiation of symptom-sign complex, Journal of the American College of Traditional Medicine 1983; 2: 25-29. Cheung CS (translator), Current status of TCM cancer therapy: an abstract of Dr. Li Ming Ming's review, Journal of the American College of Traditional Medicine 1987; 2: 58-67. Xie Renfu, Liao Junxian, and Ma Rou, How do herbal medicines tonify the kidney and ameliorate the marrow microenvironment work on hemopoiesis? , Chinese Journal of Integrated Traditional and Western Medicine 1995; 1(1): 47-51. Yang Jingming, et al., Invigorating qi and promoting blood circulation in treatment of chronic idiopathic thrombocytopenic purpura, Chinese Journal of Integrated Traditional and Western Medicine 1996; 2(1): 12-141. Xu Daofeng, et al., Analysis of trace elements in jixueteng, Studies of Trace Elements and Health 1993; 10(2): 36-38. Ling Yeou-ruenn, A New Compendium of Materia Medica, 1985 Science Press, Beijing. Yan Dexin, Aging and Blood Stasis, 1995 Blue Poppy Press, Boulder, CO.
Liu Shaoyu, An observation of treating 62 cases of thrombocytopenia with Chinese herbs, Journal of Traditional Chinese Medicine; 1985. Lin Mao, et al., Constituents of Spatholobus suberectus, Chinese Traditional and Herbal Drugs 1989; 20(2): 53-56. Li Lin, Treatment of Psoriasis with Traditional Chinese Medicine, 1990 Hai Feng Publishing Co., Hong Kong. Ji Jun, Treatment of 30 cases of vitiligo with Huoxue Qufeng Tang, Jiangsu Journal of Traditional Chinese Medicine 1988; 9(4): 12-13. Zhou Changjian and Xu Lin, Antifertility effect and safety jixueteng injection, Fujian Journal of Traditional Chinese Medicine 1988; 19(4): 55-57. Wang Jinrong, Treatment of 60 cases of leukopenia with Yangxue Shengbai Tang, Zhejiang Journal of Traditional Chinese Medicine 1989; 24(3): 107. Jiang Songgen, Treatment of chronic skin ulcers in 48 patients with modified Guizhi Tang, Journal of Zhejiang College of Traditional Chinese Medicine 1991; 15(5): 18-19. Song Nong (chief editor), Chinese Medicated Liquor Therapy, 1996 Beijing Science and Technology Press, Beijing. Dong Zhilin and Yu Shufang, Modern Study and Application of Materia Medica, 1990 China Ocean Press, Beijing. Zhao Lichen and Chen Fang, Food therapy for blood deficiency, Journal of the American College of Traditional Chinese Medicine, 1983; 4: 70-73. Li Ninghon (editor), Chinese Medicinal Herbs of Hong Kong, vol. 1, 1985 Hong Kong Pictorial Books, Hong Kong. Vangermeersch L and Sun Peilin, Bi-Syndromes, 1994 SATAS, Brussels. Sun Yi and Liu Xiaoyan, A review on traditional Chinese medicine in prevention and treatment of multiple sclerosis, Journal of Traditional Chinese Medicine 1999; 19(1): 65-73. Chen Keji (editor in chief), Chinese Patent Medicines, 1997 Hunan Science and Technology Press, Hunan. Chen Yongzhen, et al., Clinical observation on treatment of 30 cases of leukemia by integrated traditional Chinese and western medicine, Chinese Journal of Integrated Traditional and Western Medicine 4(4): 293-295.